Here's a sampling of some of the items that have been purchased by our customers at Tribal Muse. Because most of our items are custom made, old, and/or one-of-a-kind piece, these items cannot be replaced and are no longer available for sale. Only rarely are we able to get duplicates of sold items, and those items will be identified as "Back Ordered" rather than "Sold." Elegant Scroll-Front Turkish Necklace in Silver-Plated Pewter with Jangling Coins. Vintage tribal jewelry earrings from the Sindh (Indus) River Valley that flows from the Himalayas. This a beautiful large contemporary cuff bracelet was handcrafted in the style of Ladakh tribal jewelry from the low Himalayas. Black cord necklace with large Kashef Kuchi Pendant, vintage tribal beads, and old Turkmen medallions. Elegant large Tibetan necklace handcrafted by Nepalese tribal jewelry artisans during the late 1900's. This unique pendant was handcrafted in Nepal in a traditional Tibetan jewelry style depicting sun rays radiating from the symbol for OM. One-of-a-kind. Very old Tekke Turkmen (Turkoman) bilezik cuff bracelet. Collectible tribal jewelry. This large old Turkmen Headpiece has clattering dangles that fall like rain over the forehead and a cascade of adamlyk pendants for framing the face. Vintage Afghan Kuchi tribal jewelry hair pendants pair with a beaded band - usually worn at the temples to frame the face. This ethnic jewelry bracelet was elegantly handcrafted in the USA with twisted wire and leather. Old vintage Afghan Hazara tribal jewelry necklace. Vintage Ersari Turkmen (Turkoman) dangles and amulet medallions on this large tribal jewelry choker necklace. Elegant ethnic jewelry necklace with an ornate pendant on a traditional black cord. This colorfully-beaded traditional Maasai Wedding Necklace was handcrafted in Kenya. Distinctive vintage Necklace from the Swat tribal villages located in Kashmir Valley region between India and Pakistan. Vintage Waziri Tribal Jewelry Cuff Bracelet great for dance or daily wear. Old Kuchi Tribal Bracelet with spike, colorful beads, and bell dangles. Exuberant vintage Afghan Kuchi necklace from the Mazar tribe. One-of-a-kind. Large old Turkmen (Turkoman) tribal jewelry earrings with traditional adamlyk shape - styled female form. Vintage Kashmiri tribal jewelry necklace - Dramatic multi-strand Chanda Haar from the Swat Valley. Traditional Tibetan Tribal Jewelry Necklace handcrafted in Nepal of Turquoise and Red Coral. This elegantly handcrafted necklace has a very large Lapis Lazuli pendant that hangs on an ornately beaded chain. Gorgeous piece. This is a one-of-a-kind old tribal jewelry necklace with a large colorful pendant that was handcrafted for the nomadic Kuchi tribe. This is a one-of-a-kind vintage Afghan tribal necklace from the mid-1900's that is still amazingly current in its design. Ornately handcrafted round Vintage Kuchi Tribal Jewelry Bell-Jangle Anklet. Exuberant Vintage 3-leg Baluchi (Balochi) tassels pair with double bell caps and exquisite "barley beads" for embellishing the body, clothing, home, or animals. Price is for PAIR. Large Turquoise and Sterling Silver Dangle Earrings. Large vintage tribal pendants necklace from the lush valley of Kashmir. These Long Vintage Turkmen Earrings were handcrafted of Gold-gilded Silver in a Traditional Turkmen Tribal Jewelry design. Old tribal jewelry bracelets from Central Asia were often worn in Pairs. Get this pair of vintage Afghan Kuchi tribal cuff bracelets for wearing the in the traditional style with one on each wrist - Price is for PAIR. This exotic Tibetan necklace with handcrafted Sterling Silver necklace can be yours with a click! Great looking contemporary ethnic jewelry from Nepal. Very Large vintage Afghan focal bead for your own tribal jewelry creation or for wearing as a pendant all by itself! A beautiful necklace handcrafted by tribal jewelry artisans in Nepal using turquoise, jade, and green onyx. One-of-a-kind unusual handmade ethnic necklace at Tribal Muse. Fair Trade. Mixing old Kuchi pendants and beads with new elements results in beautiful fusion tribal jewelry such as this elegant necklace...ready for wearing and dancing as the spirit moves. The unique beauty of tribal jewelry radiates from this pair of classic vintage Ersari Turkmen (Turkoman) cuff bracelets. Price is for PAIR as shown. Vintage Jangle Cuff Bracelet - a Kuchi Tribal Jewelry Classic. Very Large vintage Afghan focal bead with dangles for your own tribal jewelry creation or for wearing as a pendant all by itself! Large Pair of Vintage Ersari Turkmen (Turkoman) Tribal Jewelry Clasp Pendants - Collective, Wearable Turkmen Traditional Jewelry. This entire set of 3 large vintage Turkmen (Turkoman) tribal jewelry pendants is yours for $36.00 for the entire set! Set of 6 long vintage Kashmiri pendant necklaces as shown. Wholesale only. This extra-large vintage Turkmen embroidery was handcrafted for wearing with traditional dress. Outrageously lush and colorful PAIR of vintage Kuchi Tassels with top-loops. Classic Vintage Kuchi Tribal Jewelry - Spiked Metal Cuff Bracelets with a Pin Clasp and Bells. Price is for PAIR. We have lots more vintage Kuchi jewelry - check out the links on the side to see more too. Stunning Olami (Otamish) Turkmen tribal jewelry bracelet - artisan handcrafted in the mid-1900's. Five colorful hand-beaded Afghan tassels, each with 3 tasseled ends. Great for colorful tribal accents. Ornate Turkmen (Turkoman) horse pendant with turquoise from the Yomut (Yomud) tribe. Ornate double-headed Turkmen (Turkoman) horse pendant with carnelians from the Yomut (Yomud) tribe. Old handcrafted Silver Tuareg Tribal Jewelry from Africa. Colorful vintage Afghan Kuchi choker - encrusted with colorful beads and lots of clattering coin dangles. Great tribal jewelry piece! An exquisite and dramatic antique silver spiked cuff bracelet - skillfully and sturdily handcrafted long ago in Rajasthan India. Turkmen Ersari Vintage Tribal Jewelry Triangle Pendant with Red bead and old dangles. Old tribal earrings from the remote Fergana Valley between Uzbekistan and Tajikistan. Large Turkmen Yomut souvenir tribal jewelry necklace replica. ON HOLD through October 15, 2017. This remarkable large Chanda Haar Necklace Was handcrafted during the early 1900's in the lush Kashmir Valley of Central Asia. Classic Kuchi Necklace made with traditional Waziri tribal pendants. Price is for one necklace. Large Contemporary Afghan tribal jewelry cuff bracelet - ornately handcrafted with turquoise agate. Unique Silver and agate vintage tribal jewelry symbolic ring. Collectible, Museum Quality. Vintage Turkmen (Turkoman) Tribal Jewelry Sachlyk (Hathphool) with 5 rings, hand pendant, and simple bracelet. Fits left hand best. Vintage Swat Village Necklace from the Hazara Tribe. Distinctive vintage Double Strand Necklace from the Hazara tribal villages located in the lush Swat Valley. Vintage Berber Necklace with Tribal Pendant. Vintage Tiznit Berber Tribal Jewelry Necklace with Traditional Pendant. Large Himalayan Tibetan Mandala Necklace from Nepal. Large multi-strand Himalayan tribal necklace handcrafted in Nepal with 2 mandalas and old coral beads. Classic Old Afghan Torc Necklace - Small Traditional Small-Neck Torc Necklace from Central Asia. Large Tibetan-styled tribal jewelry dangle earrings from Nepal. Long old tribal Turkmen tassels with 6 fringed legs - each with a large brass bell at the end. This is an old beaded Bukhara wedding veil (Yazluk) handcrafted in Uzbekistan in the mid 1900's. Classic Tibetan Style Necklace of Faux Amber with Bone Turquoise and Brass Tribal Pendant. Elegant contemporary Tibetan-style Necklace handmade in Nepal faux amber and bone dzi beads. Intriguing Tibetan-styled tribal jewelry dangle earrings from Nepal. Classically Tibetan tribal jewelry replicas of beeswax amber handcrafted in Nepal. Large Contemporary Ethnic Necklace handcrafted as a traditional Tibetan Necklace with Big Resin Amber and Bone beads. Vintage Waziri Kuchi Tribal Jewelry Necklace large personal beaded pendant. Vintage Kuchi Tribal Jewelry Necklace from Kashmir the ornate pendant and amulets. Unusual large butterfly earrings handcrafted in Nepal. Vintage Kuchi Tribal Jewellery - handcrafted hollow Cuff Bracelets. Fits small wrists. Price is for PAIR. Large Ersari Turkmen vintage tribal jewelry traditional hair pendant. Vintage Tribal Jewelry Necklace from the Afghan Kuchi tribe in the region of Waziristan. Loaded with Heritage! This extraordinary two-tiered vintage Afghan Kuchi Shoulder Drape (Camel "Necklace") has lots of old pendants, coins, and tassels on traditional yellow-beaded bands. Handcrafted vintage. Very Old Kuchi Bazuband for wearing on the upper arm - unusual tribal jewelry. These extraordinary vintage tribal tassels are traditional jewelry accessories of the nomadic Ghilzai tribe of Central Asia. Large old dangly earrings handcrafted by the Hazara tribe of Central Asia. Old Turkmen Tribal Jewelry - Panel Necklaces PAIR with matching large diamond-shaped pendants (Donbajiks) and amulets. Classically beautiful Native American Jewelry from the Navajo Tribe of large Heishi. Handcrafted Native American Kingman Turquoise and Sterling Silver Earrings handcrafted by Navajo artisan Charlie Bowie with Hallmark. Handcrafted Native American Kingman Turquoise and Sterling Silver Necklace handcrafted by Navajo artisan Charlie Bowie with Hallmark. Large Hmong (Miao) Dangle Earrings of 4 large hollow globes with traditional tribal spiral designs. Elegantly stated Tree-of-Life and Turquoise Necklace. This extraordinary old Kuchi Wedding Necklace was handcrafted in the early 1900's in the Kashmir Valley. We have seen a few other snake vertebrae necklaces, but none as large or as old as this one from Northern Africa. Elegant Quality Organic Jewelry in this mixed wooden beads handcrafted necklace. Vintage Ersari Turkmen Pendants and Amulet Medallions on this wonderful Tribal Jewelry Choker Necklace. Contemporary Ethnic Jewelry Necklace with large Baule Tribal Head, Bone, and Faux Amber. Old Turkmen Necklace - Tribal Jewelry Choker with clattering dangles, amulet medallions, and colorful eye-beads. Vintage Kuchi Crescent Pendant and old Coins on traditional black cord Necklace. Large Ornate Vintage Tribal Jewelry Kuchi Necklace. Richly embellished Large Vintage Tribal Jewelry Choker Necklace from the nomadic Kuchi Tribe of Central Asia. Vintage Turkmen (Turkoman) Tribal Jewelry - Long Necklace with Gilded Pendant and chain with old amulet medallion connectors. Large Old Turkmen Pendants PAIR (Dogachik) that frame the face beautifully. The removable embroidered headband can also be worn as a choker. This vintage Afghan Hazara Tribal Jewelry Pendant can be worn as a necklace, hanging from a belt, or as part of a headpiece. Unusual Vintage Filigree Necklace from the Hazara Tribe of Central Asia. Nepalese Cuff with Large Lapis Lazuli Stones. Contemporary Lapis Lazuli and Brass cuff bracelet handcrafted in Nepal. Outrageously colorful large vintage Kuchi Tassel with top-knot tie. A Delicate look, but sturdily made pendant on this Vintage Necklace has deep blue Afghan Lapis Lazuli stones. Skillfully beaded long triple-leg colorful Afghan Balochi single tassel. Large Kashmiri Vintage Crescent Earrings with and vibrant pink and unusual clattering dangles. Unusual Old Turkmen (Turkoman) 60% silver tribal jewelry earrings in Adamlyk shape (Stylized female form). 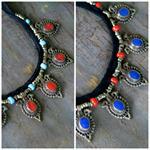 Classic Kuchi Choker Necklace made with Colorful Vintage Tribal Amulet Pendants. Vintage Afghan Hazara Tribal Jewelry Headpiece - Vintage Afghan Hazara Tribal Jewelry Eagles Headpiece that frames the face with flowing dangles. Vintage Turkmen Tribal Jewelry Sachlyk (Hathphool) PAIR. Old Tribal Bracelets PAIR from Bundelkhand central India in a traditional Betel Nut Gajra pattern. Fits very small wrist. Large Vintage Tribal Jewelry Beaded Necklace from the Swat Kashmir. This Large Vintage Waziri Tribal Jewelry Double-Draping Gypsy Necklace was handcrafted in the mid 1900's. This Large Vintage Kuchi Barrette was handcrafted in the mid 1900's with sparkling beads and a 2-part design. Vintage Ersari Turkmen Adamlyk Pendants and Amulet Medallions on this wonderful Tribal Jewelry Necklace. Vintage Ersari Turkmen Pendants and Amulet Medallions on this wonderful Tribal Jewelry Necklace. Traditional Uzbek Hand Embroidered Topi Cap with Notched opening in front for Child or Small Adult. Ornate Pair of vintage Kuchi Cuff Pin-Clasp Bracelets with colorfully beaded details. Price is for PAIR. Old Kuchi Tika Forehead Pendant was handcrafted in the mid to early 1900's and remains in excellent wearable, collectible, and dance-able condition. Old Tree-of-Life Pendant with 5 Blossoms on a Black Kumihimo Braided Neckband. Flowing Vintage Pendants for framing the face from the Khost Kuchi Tribe. Large Elaborate Vintage Kuchi Tribal Jewellery Necklace. Colorful Large Vintage Tribal Jewelry Necklace from the nomadic Kuchi Tribe. Large Vintage Tribal Jewelry Beaded Necklace from the Swat Kashmir region of Central Asia. Bedazzled with colorful beads and lots of tinkling bells, this wonder Jhoomar Forehead Headpiece is classic Vintage Afghan Kuchi Tribal Jewelry. Classic Kuchi Choker Necklace made with Vintage Tribal Amulet Pendants all in Red. Elegantly charming - Vintage Tribal Necklace handcrafted in Samarkand with repeating Peacocks and a fringe of jangling Pipal Leaves. Vintage Turkmen Tribal Green Striped Silk Chapan - Russian Cotton Lining. Large Vintage Tribal Jewelry Headdress from the Afghan Kuchi Tribe. Four strands of vibrant carnelians stones in the elegant handcrafted necklace. Colorful Vintage Kuchi Necklace with a Tumar Amulet Pendant for holding prayers, wishes and secrets. One-of-a-kind Vintage Tribal Meenakari Necklace from the Swat Valley of the Hindu Kush. Old Tribal Coin Jewelry from the Afghan Kuchi Tribe - wonderful piece in excellent condition. Very well made Old Kuchi Tribal Jewelry Necklace. Very well made Large Old Kuchi Tribal Jewelry Necklace. Elegant Vintage Tribal Jewelry necklace handcrafted in the Kashmir Valley at the base of the Himalayas during the mid 1900's. Tribal Nose Ring from the Afghan Balkh Province bordering Turkmenistan. Classic Large Collectible Afghani Tribal Jewelry Necklace from the Swat Tribal Region of Northern Afghanistan. Afghan Kuchi elaborately hand-beaded hip belt with sparkling mirror dangles. Himalayan Tribal Jewellery - Large Ornate Dangle Earrings. Ornately handcrafted Large traditional Earrings from Nepal. Unique Vintage Gilded Tribal Jewellery Earrings from Uzbekistan Kuchi. Classic Old Sindh Large Flower Earrings with Domed Bell Dangles. Drapes of colorful beads in this dramatic ethnic necklace from Nagaland. Moroccan Tiznit Berber Tribal Jewelry Necklace with Vintage Beads and Atlas Amber. Elegant Vintage Kuchi Tribal Jewelry from Kashmir. Colorful Vintage Kuchi Tribal Jewelry Necklace from Kashmir. Large Multi-Strand Vintage Kuchi Tribal Jewelry Coins Necklace. Stunning large vintage Kuchi Tribal Jewelry Earrings handcrafted in mid-1900's in Kashmir. Stunningly handcrafted in the mid 1900's - Vintage Kuchi Tribal Jewelry from Afghanistan. Beautifully handcrafted vintage Kuchi Tribal Jewelry pendants and tailored neckband on this stunning Tribal Necklace. Unusual incised vintage Tribal Long Ring from Kashmir. Elegantly balanced this sophisticated Sea Agate Necklace was made from stones found on the ocean floor. Outrageously wonderful vintage 5-pendant Kuchi Tribal Jewelry Necklace from Kashmir. Ethnic Bone Pendant Necklace from Nepal - Natural Bone Pendant and side beads in this classic Ethnic Necklace handcrafted in Nepal. Vibrant faceted red beads in this large vintage Kuchi Tribal Crown Ring. Colorful contemporary Tribal Jewelry Necklace with Tiered Afghan Laghmani Pendants. Extraordinary long Himalayan Necklace in the Tibetan Tribal Jewelry style with lots of old beads. Long Vintage Kuchi Tribal Jewelry Pendant Necklace with lots of clattering dangles. Traditional Turkmen Tribal Jewelry Panel Necklace with large Old Gonjik Square pendant. Beautiful Large Vintage Matikka Tribal Jewelry Forehead Pendant - Great for wearing as a necklace. Unusual Vintage Kuchi Tribal Jewelry Pendant with Elegant Style. Elaborate Large Vintage Tribal Jewelry from India. Stunningly beautiful - old Tribal Jewelry from India. Vintage Kashmiri elaborate necklace, dramatically handcrafted with large pendants, tumar cases, and amulet charms. Nepalese Handcrafted Ladakh Collar Necklace in Turquoise, Resin, and Coral-Glass Beads. Ladakh Handcrafted Beaded Collar Necklace from Nepal. Nepalese Handcrafted Ladakh Collar Necklace in Turquoise, Resin, and Coral-Glass Beads. Beautiful Dangle Earrings of deep blue natural Lapis Lazuli stones in a Sterling Silver star-burst setting. These wonderful old Earrings were handcrafted in Silver during the early 1900's by Sindh Tribal Jewellery artisans. Extra-Large and Gorgeous vintage Kashmiri Tribal Jewelry Dome Earrings with Double Veil Chains and Lots of Dangles. Extraordinary Antique Teke (Tekke) Turkmen Tribal Jewelry - Antique Egme (Edme) Silver Headpiece. worn by Turkmen women after marriage to convey their status. Exquisitely Tribal - Old Nosering from Northern Afghanistan Balkh Province bordering Turkmenistan. Wearable, Collectible, handcrafted Tribal Jewelry from the early 1900's. Afghan Kuchi Tribal Jewellery Necklace with Elaborate Long Links and Clattering Dangles. Beautiful large vintage Kuchi Tribal Earrings from Northern India. Huge Tibetan souvenir pendant of faux amber handcrafted in Nepal. Classically Tribal Right-sided bejeweled Nose Ornament with chain - Ornately handcrafted vintage Kuchi Tribal Jewelry. Warm Earthy Colors in this Multi-Strand Beaded Necklace. Distinctive Pomegranate-Pink Beads on this elegant multi-strand Chanda Haar Vintage Swati Tribal Necklace. Old necklace from Nagaland with large bone beads and disks. Large Old Tribal Jewelry Silver and Amber Ring handcrafted in the Himalayas in the mid-1900's. Large contemporary Sterling Silver Tibetan Jewelry Ghau(Gau) Amulet Pendant handcrafted with real Amber and Red Coral in Nepal. Long Vintage Sindh Dangle Earrings from the Indus Valley in Northern India. Large Old Himalayan Tribal Jewellery Tibetan Turquoise Pendant. Large Old Tibetan Turquoise Pendant handcrafted in the Himalayas in the early to mid-1900's. Exquisite Collectible Museum Quality piece. Large Moroccan Tribal Jewellery Bracelet with Classic Berber colors. Large Handcrafted Dangle Earrings handcrafted in Nepal of Lapis Lazuli, Red Coral, and Sterling Silver. Ornately Embellished Large Old Conch Shell Pendant handcrafted in the Himalayas during the mid to early 1900's. Large Old Tibetan Garuda Pendant handcrafted in the Himalayas in the early to mid-1900's. Exquisite Collectible Museum Quality piece. Large Ornately handcrafted Tribal Cuff Bracelet from Nepal. Large Vintage Sindh Dangle Earrings from the Indus Valley in Northern India. Large Multi-Strand Vintage Kashmiri Tribal Jewelry Beaded Necklace in excellent condition. Very large Vintage Kuchi Tribal Jewelry Hoop Earrings with lots of clattering dangles. Classic contemporary Tribal Jewelry Burmese Bracelet handcrafted in Nepal. Elegant Large Nepalese Necklace of Turquoise and Red Coral. Jasmine Gypsy Necklace with Vintage Elements from the Indus Valley in Northern India. Collectible Antique Gilded-Silver and Carnelian Necklace from Central Asia or Persian Turkmen Tribe. Museum Quality. Vintage Afghan Hazara Tribal Jewelry Headpiece that accentuates the face. Classic Large Kuchi Tribal Jewelry Earrings with lots of bell dangles and vibrant red glass crescents. Large Moroccan Berber Tribal Jewellery Necklace with Southern Cross (Boghdad) Pendant and Vintage Beads. Colorfully beaded traditional necklace from the snake charmer Kalbelia (Kalbeliya) Gypsy Tribe of Northern India. Large Unusual Himalayan Tribal Jewelry Bracelet Handcrafted in Nepal. Contemporary Turquoise and Brass cuff bracelet handcrafted in Nepal with large natural Turquoise stones. Remarkable Large Old Naga Beaded Necklace from Nagaland. Large Vintage Kuchi Crescent Jangle Earrings with Veil Chains. Elegant Contemporary Himalayan Necklace of Turquoise, Lapis Lazuli, and Red Coral in Sun-rays pattern. Elegant Contemporary Himalayan Necklace of Turquoise and Red Coral in Sun-Moon pattern. Elegant Contemporary Himalayan Necklace of Turquoise and Red Coral in Sun-rays pattern. Classically Tribal - Contemporary Tibetan Jewelry with Mountain Coral Design. Exclusively Traditional Long Tribal Jewelry Necklace handcrafted in Nagaland. Beaded Kuchi Tribal Jewelry Choker with multiple double-sided vintage charm dangles. Afghan Kuchi elaborately hand-beaded belt with sparkling mirror dangles.. Elaborately hand-beaded large vintage Afghani-Kuchi belt with sparkling mirror dangles. Afghan Pashtun handcrafted beading forms the base of this extraordinary Tribal Textile Belt. This vintage African Tuareg Tribal necklace was handcrafted in silver and brass in the mid 1900's. Unique one-of-a-kind handcrafted Vintage Tuareg Tribal Jewelry Amulet of Silver and Brass Tscherot Pendant Necklace. One-of-a-kind Tribal Beaded Afghan Kuchi Panel. Vintage Afghan Kuchi Tribal Beaded Panel. Stunning contemporary Ethnic Cuff Bracelet. Large Multi-Strand Vintage Kashmiri Tribal Jewelry Beaded Necklace. Vintage Afghan Kuchi Tribal Jewelry Bracelet - Unusual Vintage Afghan Tribal Jewelry Cuff Bracelet with Shield-shaped large center Bead. Old Silver Pendant from Northern India depicting Ganesha with his mother Parvati. Handcrafted mid 1900's. Orgun Nawa vintage Kuchi Tribal Jewelry - Ornate Handcrafted Necklace. Unusual Tribal Jewelry - Vintage Baluchi Kuchi Large Ornate Head Piece. Dramatic Vintage Tribal Jewelry - Chanda Haar Necklace with 9 cascading chains and beaded charms. Handcrafted in the Hindu Kush. Sterling Silver Tibetan Pendant Necklace handcrafted in Nepal. Classic Old Afghani Ornate Torc Necklace from Laghmani Province in the Hindu Kush. Ornately Embellished Large Old Bone Tooth Pendant handcrafted in Nepal. Traditional Afghan Tribal Jewelry Turquoise Ring. Traditional Vintage Afghan Tribal Jewelry Carnelian Ring. Colorfully Beaded Vintage Kuchi Tribal Jewelry Cuff Bracelet. Ornately Handcrafted Old Kuchi Afghan Tribal Jewelry Cuff Bracelet with pin-clasp from the early 1900's. Golden-colored glass beads on this elegant contemporary Choker Necklace with button clasp. This Necklace is currently ON HOLD for a customer. One-of-a-kind Large Old Triple-Hirz (Tawiz) Amulets Necklace handcrafted in Saana Yemen. Beautiful Vintage Afghan Hazara Tribal Jewelry with clattering dangles and a bejeweled center to frame the face. Ornately crafted large vintage beaded Tribal Jewelry Necklace from Kashmir with large incised Pendant and sturdy bell dangles. Vintage Lion and Sun coins on this black cord necklace. Classic Gujarati Village Jewelry - Vintage Khatria Bangle Bracelet. Classic Rajasthani Village Jewelry - Vintage Khatria Bangle Bracelet. The front of this traveling-shrine necklace has the powerful mantra "Om Mani Padma Hum" and the ever-protective face of Kirtimukha. Vintage Kashmiri Chanda Har Necklace with dramatic cascades of draping chains and beaded pendants. Rich with heritage ... Large skillfully handcrafted Silver Asyk Pendant traditionally given to Turkmen women to bless them with good fortune. Festive Kuchi Vintage Tribal Jewelry Necklace with Choker Neckline and 2 rows of ornately embellished jangly coins. Contemporary Tribal Jewelry Earrings skillfully handcrafted in ancient style by Bukhara artisans. Large Vintage Kuchi Flower-Crescent Jangle Earrings studded with sparkling beads and loads of bell-dangles. Classic Kuchi Tribal Jewellery. Some of our prettiest Vintage Kuchi Tribal Jewelry Earrings...vibrant red crescents among colorful beads and tinkling bells. Unusual Handcrafted Old Bracelet from the Kashmir Valley in the foothills of the Himalayas. Beautifully beaded triple-leg vintage Afghan Kuchi tassels pair with embroidered ends. Beautifully made triple-leg vintage Kuchi tassels pair from the Kashmir Valley. Long bejeweled old Afghan Khost bracelet with pin-clasp and spikes. Vintage Tribal Jewelry Kuchi Necklace with 3 colorful rows of beaded pendants. Large antique Bukhara Earrings handcrafted in high grade silver, carnelians and turquoise stones in the early 1900's. Kashmiri Tribal Jewelry Necklace handcrafted in the mid to late 1900's. Gold-gilded vintage handcrafted silver Turkmen earrings. Gold-gilded handcrafted vintage silver Turkmen earrings. Traditional Vintage Afghan Hazara Tribal Jewelry - stunning headdress for the forehead with dangles that frame the face and a bejeweled center crown-pendant. Antique Turkmen Tribal Jewellery - Very large handcrafted Silver Tumar Pendant in excellent condition - Museum Quality piece. Kashmiri Tribal Jewelry Necklace from the mid to late 1900's...classic jewelry from Kashmir Jammu region. Unusual Old Banjara Tribal Jewelry Armlet with tufted tassels. Old Silver Bhairava Silver Pendant from Northern India. Large Antique Silver Amulet Pendant from Northern India - over 100 years old one-of-a-kind piece. Gorgeous Large Old Silver Turquoise and Coral Earrings. Necklace with Collectible Old solid silver pendant of Surya the Sun Deity handcrafted in Northern India. Vibrant Carnelian stones set in Sterling Silver - Delicate quality dangles. Unusual Old Kuchi Tribal Bracelet with Spike. Colorful Vintage Kuchi Crescent Earrings with lots of bell jangles. Large Vintage Kuchi crescent earrings with beads and bell jangles. Large old silver earrings handcrafted in Bukhara Uzbekistan in the early 1900's...excellent condition. Large Citrine Pendant on contrasting Kumihimo Neckband for an elegant Necklace. Beautifully handcrafted in Nepal clusters of rich turquoise beads set in raised bezels. One-of-a-kind ornate vintage long pendant from Central Asia on twisted black neckband. Richly embellished Turkmen Tribal Baby's Dress. Vintage Handmade Embroidered Nomad's Coat from Uzbekistan. These unusual handcrafted vintage Turkmen tribal house shoes have a soft leather lining, simple leather soles, and traditional embroidery on pomegranate-red cotton fabric. These wonderful handcrafted vintage Turkmen tribal house shoes have a soft leather lining, simple leather soles, and traditional embroidery on pomegranate-red cotton fabric. These wonderful handcrafted vintage Uzbek tribal house-shoes have a soft leather lining, simple leather soles, and traditional embroidery on sturdy woven cotton fabric. Elegant Old Silver Ceremonial Earrings from Central Asia. This one-of-a-kind old Silver Ring was handcrafted in the early 1900's for special occasions. Elegantly ornate large vintage Tribal Jewelry Bazuband (upper arm band) from Afghan Kuchi Tribe. Distinctive Large Vintage Jewelry Pendant from the Hazara tribe in Afghanistan. One-of-a-kind original Necklace from Tribal Muse that elegantly combines elements from various traditions into one sophisticated piece. This luxurious necklace holds a huge Collectible Vintage Kuchi Tribal Pendant handcrafted in the mid 1900's. One-of-a-kind. Classic Kuchi Tribal Jewelry Earrings with lots of bell dangles and sparkling blue crescents. Turquoise and Black Onyx large pendant on a multistrand neckband for an elegant Nepalese necklace. Vintage Tribal Cuff Bracelet from the Kuchi of Waziristan. Unusual old Kuchi Tribal Jewelry Cuff Bracelet. Old Nasiri Cuff Bracelet from Waziristan handcrafted in the early to mid-1900's. Exotic and Collectible...old Nasiri Cuff Bracelet from Waziristan handcrafted in the early to mid 1900's. Kashmiri Tribal Jewelry Necklace from the mid 1900's...classic jewelry from Kashmir-Jammu region. Great looking Men's Stainless Steel Bracelet - Unusual and Sophisticated Cuff. One-of-a-kind Vintage Tribal Jewelry Necklace from the Kashmir-Jammu valley located in the Himalayan foothills. Stunning Large Storyteller Navajo Bracelet of Sterling Silver and Natural Turquoise handcrafted by Navajo Jewelry Artisan Richard Singer. Hallmark on back. Old Silver Pathri Pendant from Northern India celebrating Lord Shiva in Tribal Form (Pashupati). Old Silver Pathri Pendant from Northern India celebrating Vishnu's triumph over the demon Gayasur. Old Silver Pathri Pendant from Northern India celebrating Goddess Dasha Maa. 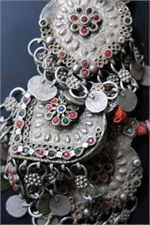 Antique silver dangle earrings handcrafted over 100 years ago in Bukhara Uzbekistan. Antique silver dangle earrings from Uzbekistan handcrafted over 100 years ago by master Bukhara Tribal Jewelry artisans. Collectible Old Waziri Tribal Hoop Earrings - Handcrafted with long, long dangles. Exotic Nepalese Bracelet of Natural Turquoise Mosaic handcrafted in an ornate setting of brass and silver. Exotic Nepalese Bracelet of Natural Turquoise and Lapis Lazuli handcrafted in an ornate setting of brass and silver. Elegant jangling belt handcrafted in Istanbul. Drapes of colorful beads in this dramatic Naga-styled necklace from Uttar Pradesh. Antique Taviz amulet silver pendant handcrafted in old India - excellent condition. One-of-a-kind fusion necklace of old Turkmen silver pendant with red coral and contemporary beads. Natural Turquoise and Vibrant Red Coral in this stunning contemporary Sterling Silver Ring handcrafted in Nepal. Vibrant Red Coral and Sterling Silver Ring handcrafted in Nepal. Vintage Nepalese Coins strung on new brown cord for this traditional Tribal Jewelry Necklace. Wonderfully old Extra-Long Silver Tribal Dangle Earrings from Uzbekistan. Elegant Tibetan Necklace with Turquoise and Red Coral. Large Tiger Eye and Sterling Silver Ring from Nepal. Elegant Large Tiger Eye and Sterling Silver Ring. Beautifully handmade contemporary Jewellery from Nepal. Contemporary Replica of Old Tibetan Jewelry Cuff Bracelet with Natural Turquoise and Ornate Metalwork. Hidden Push-Clasp opens/closes for secure fit around wrist. Great for both men or women. Vintage Aqeeq Men's Silver Ring handcrafted in Afghanistan. Classic Banjara Tribal Jewelry Necklace with Sun-Burst Pendant and Old Coins. Contemporary large Tribal Jewelry earrings handcrafted in Nepal. Traditional Ladakh Tribal Jewelry Necklace handcrafted in Nepal of Turquoise and Red Coral. Infinitely Tribal! This wonderful vintage Kanthshri Tribal Necklace was handcrafted in Nepal in the mid to late 1900's. Hauntingly beautiful. 7-Tiered Huge Hmong (Miao) Tribal Torc Necklace - Traditional Hill Tribe Jewellery. Large Vintage 3-Pendant Tribal Necklace with Clove bead tassels. Replica of Ancient Turkmen Yomut Dagdan Medallion as Large Necklace. This stunning Vintage Kuchi Headpiece piece is made with an unusual red signet bead and traditional blue-beaded Kuchi center pendant. Large bead-encrusted incised vintage Pendant on a chain Necklace handcrafted in Kashmir in the foothills of the Himalayas. Elegant Vintage Nepalese Bracelet ornately handcrafted in the mid-1900's. Large Tibetan Tribal Jewelry Replica of Antique an Articulated Cuff Bracelet - Handcrafted in Nepal. Vintage Traditional Tribal Dress from Afghanistan. Gorgeous Hand embroidered classic tribal fashion. Stunning vintage Kashmiri Tribal Jewellery Pin-Cuff Bracelet. Old Yemeni Necklace with ornately handcrafted globe beads and red agate cranberry beads. Vintage Tribal Jewelry Ornate Loop Earrings from the Ancient Sindh Valley. Old Turkmen Cuff Bracelet from the Ersari Olami Tribal Group - Collectible. Vintage Tribal Jewelry necklace handcrafted in the Kashmir Valley at the base of the Himalayas during the mid 1900's. Long-cuff Afghan Khost bracelet with pin clasp and Lapis Lazuli stones - Slightly irregular. Contemporary Ethnic Necklace from Nepal designed with Tibetan Tribal Jewelry Styling. Unusual Vintage Kuchi Tribal Jewelry Necklace from the Kashmir Valley region at the base of the Himalayas. Unusual Vintage Tribal Jewelry Necklace from the Jammu-Kashmir region at the base of the Himalayas. Large Pair of Vintage Ersari Turkmen Tribal Jewelry Clasp Pendants - Collective, Wearable Turkmen Traditional Jewelry. Handcrafted contemporary Large Turquoise stone and ornately incised Silver-Plated Cuff Bracelet. Beautifully detailed Afghan Tribal Jewelry Necklace from the mid 1900's with Long Ornamental components radiating from hand beaded neckband. Unusual Tribal Jewelry - Vintage Afghan Baluchi Hair Pendants Pair with Embellished Pipal Leaf dangles. Vintage Banjara Tribal Amulet Case and old coins on black cord neckband embellished with buttons. Unusual large old handcrafted brass Camel Anklet - Collectible. Unusual exuberant Vintage Tribal Jewelry Kuchi Necklace from the Orgon-E Nawa region of Afghanistan. This ornate Vintage Dagger is typical of those worn by men throughout Yemen (Janbiya) and Oman (Khanjar). Rugged Faux Amber Nepalese Pendant on twisted silk cord necklace. Unique Large Vintage Tibetan Jewelry of Honey Amber and high quality Silver. Traditional Vintage Tribal Kashmiri Jewelry Pendant. Extra Large and dramatic - Vintage Turkmen Tribal Jewelry 2-Part Triangle Pendant from the Ersari Tribe. Unusual Afghan Hazargi Turkmen Rectangular Tribal Pendant with ornate design. Distinctive Large Vintage Turkmen Jewelry Pendant from the Hazara tribe in Afghanistan. Distinctive Large Vintage Hazargi Jewelry Pendant from Kashmir. This unusual large vintage Kuchi pendant was handcrafted in the mid 1900's in the mountainous tribal region of Waziristan bordering Afghanistan. Gorgeous Vintage Ornate Kashmiri Bracelet of Stainless Steel. Incredible detailing. Handcrafted mid to late 1900's. Delicately handcrafted Vintage Turkmen Tribal Jewelry Eye-Bead Necklace. Classic Vintage Kuchi...3 square bell-jangle pendants and 4 old coins on this Vintage Kuchi Tribal Black Cord Necklace. This Tibetan Gau houses an icon of the Buddha. It opens from the back in the traditional way for safekeeping prayers, dreams and wishes. This amulet pendant was handcrafted in Nepal of brass in the mid to later 1900's. Unusual Old Banjara Tribal Jewelry Armlet with tassels. Vibrant old Afghan Pashtun embroidery forms the base of this extraordinary Tribal Textile Belt with lots Vintage Kuchi Dangles for making joyous sounds with every movement. Vintage Afghani coins, buttons and dangles on this one-of-a-kind Kuchi Textile Belt. Elegant Natural Turquoise Necklace handcrafted in Nepal. Fair trade jewelry.